Welcome to my page of hints, tips, pointers, advice, and lessons learned for Pan-Mass Challenge riders. This is all of the secret knowledge gleaned from more than a decade of participating in the PMC charity bike ride. Whether you're a first-timer or a longtime veteran, I guarantee you'll find something useful here. And I hope you have a wonderful PMC experience! If you have additional tips that you'd like to share with other riders, please send them my way so I can incorporate them here! If you want to ride the traditional route from Sturbridge to Provincetown, sign up as soon as registration opens in January. It sells out very quickly. If you want to ride a particular route but find that it's already sold out, sign up for another route, because the next year, as a returning rider, you will be allowed to sign up before registration opens to the general public. During registration, if you're in doubt about which to order, opt for the official cycling jersey rather than the tee shirt. You can always buy a tee shirt later. If you want to get decent rest Saturday night, plan to stay in a hotel off the MMA campus. The dorms aren't very restful. Second choice are the on-site tents, although you'll be at the mercy of the weather. If you do want to stay in a hotel in Sturbridge, Bourne, or Provincetown, book your rooms a year in advance. Yes, really. The options are very limited and they sell out fast! Expect nearly all the hotels on Cape Cod to have a two-night minimum. That's a bummer, but it's also a good excuse to stay Sunday night, take Monday off, and spend an extra day relaxing on the cape! Try to convince your friends to ride, too. It really is a much better experience when shared. The usual PMC Twitter hashtag is #PMCyyyy where 'yyyy' is the current year (e.g. #PMC2019). It's interesting to monitor it to hear what other riders are up to. If you're riding a hybrid or mountain bike, get skinny tires. The difference in rolling resistance is very significant. Clipless pedals: they're also usually a good idea. Shimano mountain bike style cleats are recessed, so they're easier to walk in than traditional road cleats. Wear padded cycling shorts. Like all of the odd things that cyclists do (well, most of the odd things), there's a good reason why everyone wears them. Without underwear. Get a water bottle with a wide mouth, so that you can stuff ice into it as well as liquid. The PMC always does a great job providing ice! You can buy insulated water bottles at your local bike shop. They're not going to perform miracles, but they're definitely worth the small extra cost to help keep your drinks cool. If you have room for two bottles, make one a sports drink and one water. You can always pour the latter over your head on a really a hot day. Pouring Gatorade over your head only sounds like a good idea in the moment! If you are prone to muscle cramps, consider bringing electrolyte pills to ingest along the way. There's no guarantee they'll work for you, but they probably can't hurt. As always, test these out on training rides before the day of the event. Train for the ride. You'll be much happier if you do. Gradually increase your mileage until you're comfortable doing about 60 percent of the ride's distance. That'll build up your stamina sufficiently to complete the event without putting undue stress on your body. Also do a few long back-to-back rides on consecutive days, to get your body used to getting back on the bike a second day in a row. Pedal at low resistance and rapid cadence to save your knees. Beginners usually select a gear that's too big/hard, which can damage your knees and makes cycling more work than necessary. Get used to spinning at a higher cadence with lower resistance. Make sure that some of your training is on big hills, which will dramatically increase your strength. Hill repeats will provide the biggest training benefit of anything you can do. Although hard training is the trigger that tells your body it needs to get stronger, remember that it can only get stronger while you're resting. Get plenty of it, and rest just as diligently as you train, if not more so. If you don't feel like a slacker on your recovery days, you're doing it wrong! Begin your season with long, easy, aerobic base miles. Then, once you've achieved your basic fitness level, move on to shorter, more intense hill repeats and interval training. Don't focus your training on mileage alone, because beyond a certain point more miles yield no benefit at all. Don't train so much that you lose your desire to ride or your performance starts trending downward. That's called overtraining, which happens when you're not getting enough rest for your body to recover and strengthen. One of the best things you can do after a ride is supply your body with the easily-digested fuel it needs to rebuild. Your body is primed to do this in the first hour after a ride, so the first thing I often do after a workout is down a glass of fat-free chocolate milk, which has just the right balance of carbs and protein. You're pretty much riding all day, so learn how to gauge your effort and how to recover on the bike after a hard hill. Experiment incorporating basic stretching into your pre- and post-ride routine, especially hamstrings, calves, quads, IT band, and neck. Wear sunblock. Serious sunblock. It's much easier to apply to shaved legs, by the way. Practice eating and drinking on the bike, and test the foods you plan to ingest on the ride to make sure your body will tolerate them well. Don't make significant dietary changes on the day of the event! Practice grabbing your water bottle with a reverse grip, with your thumb toward the bottom rather than the top. That makes it easier to squeeze the bottle and drink from the side of your mouth, so you don't have to raise your head and take your eyes off the road to drink. Learn how to ride comfortably in a pack with other riders. Don't let the PMC be your first group ride! This is my most important safety tip, because the first time you ride in a big pack of mixed riders can be both dangerous and harrowing. Postride stretching and self-massage are also great aids to recovery. The ideal training diet is very low in fat, very high in complex carbs, and moderate in low-fat protein (most Americans get more than enough protein, so you don't need to increase it). On the bike, even simple carbs (sugars) have a role in providing quick energy. Don't be afraid of eating, because a cyclist working hard can burn 1,000 kCal per hour. 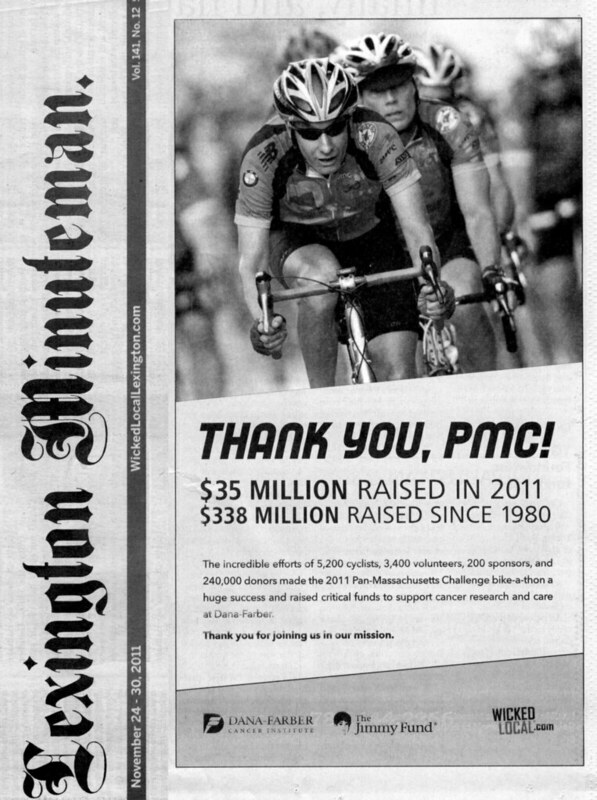 There are a couple century rides that happen two weeks before the PMC, and they are a great test of your readiness. The Charles River Wheelmen's hilly "Climb to the Clouds" is one option. For an even bigger challenge, try the Mt. Washington century in Conway, New Hampshire. If you can do these difficult rides, the PMC will be no problem at all. Linkedin, Facebook, Twitter, blogs, email lists: use every social networking opportunity both to get the word out and to gather names for your list of contacts. Use the ride as impetus to keep in touch with old friends and reconnect with former friends. One of the side benefits of fundraising is that it encourages you to reach out to people you care about at least once a year. Try to tailor your fundraising letters to each person. Don't just blast out one generic mass mailing. The more personal you make it, the more real it feels to people. Another reason to avoid mass email blasts is keeping yourself off lists of spammers. Fundraising emails are worthless if they're automatically filtered into a spam folder. Give your sponsors a reason to donate: whether it's the story of someone you know fighting cancer, a personal goal you've set for yourself, or a gift that they'll earn for making a donation of a certain amount. Track every interaction you have with your sponsors, and never let someone get away with saying they'd support you without coming through. Maintain a spreadsheet or database of your contacts. Some people feel guilty for not making a big donation, so they decide not to give anything at all, rather than something small. Find a way to make them feel that giving a small amount is better than giving nothing at all. Setting a goal of reaching a certain number of sponsors can help in this regard. After every donation, make sure you ask whether the sponsor's employer has a charitable matching gift program. That's free money! Be very watchful of your sponsors' matching gifts, especially if their employers have systems that automate sending matching gifts. Such systems usually aren't smart enough to know to credit a donation for an individual rider. Don't be afraid to email the PMC headquarters to chase them down and ensure you get properly credited for those matching donations! Once they've made a donation, personally and promptly thank your sponsors and continue to send them periodic updates about your ride to help them feel involved. Take opportunities to involve your sponsors in the ride by sending emails before and after the ride, around the fundraising deadline, and after the check presentation. Bring your bike into the shop for a tune-up 1-2 months before the ride. Not last minute. Avoid making any major changes to the bike or its fit in the final weeks before the ride. Taper your training the week before the ride. Do at most a couple *very* easy rides, just to keep your legs loose. It's nice to start the PMC well rested, with peak fitness and replenished desire to spend time in the saddle. The week before the ride, the only thing you'll do by working out is ensure that you start the ride fatigued. Be sure to get plenty of sleep the days before the ride, so that you know you're fully recovered from training. Drink lots of water in the 48 hours before the ride, right up to the start. Start the ride a bit overhydrated. Clean and lube your bike and do a short, very easy shakedown cruise the day before the ride, just to make sure everything works and is ready to go. While you should eat well, you really don't need to overeat before the ride. Just be sure to have something lowfat and low-fiber the morning of the ride, preferably an hour or two before the start. You don't want to start the ride on an empty tank! Some people make it a true pan-Massachusetts ride by riding from the NY border to Sturbridge on the Friday before the official ride. If you want to do this, do serious hill training, and contact one of those groups to ride with. On Friday when you check into the event, the volunteers will attach a plastic wristband that you have to wear all weekend. Typically, they'll have to trim the excess from the wristband, and will snip straight across it with a pair of scissors. Take an extra couple seconds to round off the sharp corners from both ends of the wristband, so that it doesn't irritate your skin all weekend long. When you check in to the event, immediately run to the restroom and try on your event jersey (and shorts, if applicable) to be sure they fit. Sizing can change from year to year, and if you need to exchange them, you can do so right there at registration. Catch the opening ceremonies Friday evening. Really. Usually Billy also gives a speech before the cameras go on-air. If you can't get into the (sweltering) auditorium, it's simulcast in an overflow tent behind the hotel, and on live television, as well. Make a packing list, and keep updating it after every ride, so that you have a reliable checklist of things to bring. This is just as useful for other travel and cycling events as for the PMC. When packing, put things in separate bags based on where you're going to need them: e.g. one bag to bring to the Sturbridge hotel room, another for things you'll need on the bike Saturday, one with what you'll need in the showers at Bourne, on the bike Sunday, at the Provincetown finish, etc. Plastic grocery bags (doubled) work well for this purpose. Make sure they're clearly labeled, so you can grab and go! The PMC has a bag drop that'll transport your bags from the start to Bourne, and then to the finish. Use it! Be sure to pack street clothes (Don't forget the underwear! ), shower supplies (Two towels! ), and comfortable shoes! And use a distinctive, highly-visible bag that you'll be able to pick out in a huge luggage pile. Because there are plenty of water stops, you actually don't have to carry much during the ride. A seat bag with basic repair and first aid kits is sufficient, plus water/Gatorade and a bit of emergency food. Don't overdo it! Consider bringing a pocket camera and use it. Something small enough to fit in your cycling jersey pockets, that you can whip out and use quickly. If you're going to take pictures from the saddle, get lots of practice first, and be aware of cars and other riders around you! 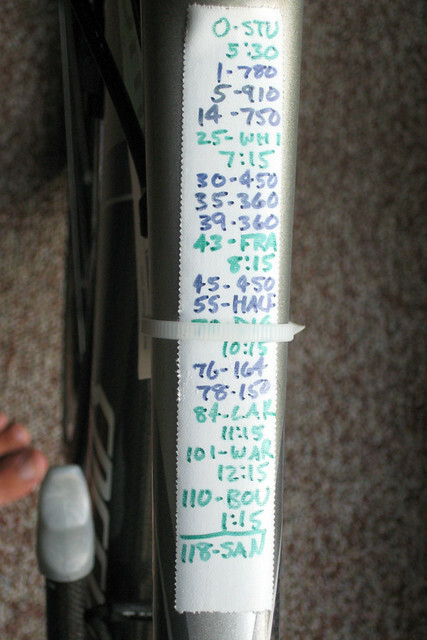 Although every water stop has signs indicating the distance to the next, it's also handy to write the distances to the water stops on a piece of cloth tape on your bike's top tube. And the major hills, too. Like this. That way you'll know what's coming up next. Estimated arrival times are good, as well. And maybe something inspirational. This is what the pros do at races. When preparing the food you'll carry on the bike, consider pre-unwrapping it and cutting it into bite-sized pieces for ease of use. But learn from my experience: don't put unwrapped donuts in your jersey pockets! Consider involving your sponsors during the ride by posting text, photos, video, or audio to sites like Twitter, a blog, Facebook, or location-based services like FourSquare and Gowalla. Getting ahead of the main pack of riders makes the ride a lot less crowded and stressful. Skipping the first water stop or taking only a short time, particularly at the lunch stop in Dighton, are the easiest ways to make ground on other riders. Start eating and drinking immediately, to stay ahead of your body's needs. Drink at least one bottle of Gatorade between each water stop. Don't ride so hard that you are panting. Your stamina will last much longer if you stick to a strictly moderate pace. The less energy you expend at the start, the more you'll have left at the end. If you have practiced it, draft other riders. This can save you 25 percent of your energy. Just be very careful, and let them know you're there. Keep your eyes peeled for official PMC event photographers along the route, although they are elusive and hard to spot. Smile and wave to anyone who points a camera in your direction, because you might find yourself on the PMC website or a newspaper article! Be businesslike at the water stops, and keep those stops brief. Finishing quickly not only gives you more time to relax when you get to Bourne, but it also means shorter lines for showers, massages, and food! There are often volunteers giving basic massages near the medical tent at many of the water stops. Enjoy the cheers of the spectators. How often do you get cheered on by crowds like that, after all? Thank them too, for coming out to support the riders. Take notes about things that go especially well or poorly, so that you can mention them to the event planners when they ask for post-ride feedback. If your phone or camera has a voice recorder function, that's a great way to note things as they happen, so you don't forget. Riders are asked to wear the official event jersey on Saturday. Bring arm warmers for Saturday morning. It's often cold at 5am, even in August. You can strip them off later. In the morning, do a couple laps around the parking lot before you line up for the start, just to check your tire pressure, brakes, and gears. Unless you're a very slow rider, line up in the fast group at Sturbridge. A lot of riders will depart from the back of that section, so that riders in the other two groups automatically wind up at the tail end of the ride amongst the slowest riders. The mass start in Sturbridge can be crowded and awkward, so use your judgement about what's right for you. Don't sweat the ride route. It'll be thoroughly marked, there'll be lots of other riders, and there'll be lots of volunteers guiding the way. You shouldn't need any maps. Don't sweat the hills. Yeah there are some, but if you've done hill training, you'll be fine. The miles are more strenuous than the hills. Watch out for the route merge just before the Dighton lunch stop; it's really dangerous with riders coming into the intersection from two different directions. If you're curious about what your century time might be, the Wareham stop is almost exactly 100 miles from the Sturbridge start. The final leg of Saturday's ride, from Wareham through Onset to Bourne, is only 8 miles. But riders are tired and it will be both congested and commercial, so be extra careful on this segment. When you arrive at the finish, get your luggage and go straight to the showers, then quickly to the massage tent. Neglect this rule and you won't get any massage. Even if you get a late massage appointment, you can sit in a "standby" area and take any tables that are still open after the scheduled riders for that period are accommodated. You can wade in the ocean behind the dorms at MMA, if you want to cool off. Or perhaps "freeze off" is a more accurate term. If you're riding with a team, official photographers take team and Living Proof portraits Saturday afternoon at MMA near the flagpole by the canal. Wear your team shirt/jersey. Sunday, wear whatever jersey you want. If you're riding with a team, they usually wear their team jerseys on Sunday. I usually wear the jersey from my first PMC. There's no organized start on Sunday; plan to leave MMA around 5am. Don't believe anyone who thinks that Cape Cod is flat. There are hills. You'll see. Especially Provincetown, Truro, and the Route 6 Service Road in Sandwich, which has a ridiculous stretch of rollers that you'll want to shoot over, if you can. There are usually ice pops at the Brewster (Nickerson State Park) water stop. After you leave Wellfleet, expect a brutal headwind on Route 6 all the way to Provincetown. If there's no wind on Route 6, don't worry: you'll run into it when you turn back from Race Point. It's nice to merge in with a paceline for those segments. Don't be fooled when you see the Pilgrim Monument and the "Entering Provincetown" sign. There's still several more miles as you loop out to Race Point and back into town. When you make the turn at Race Point, zip up your jersey and keep your eyes peeled for the event photographers! When parking in the bike line at Provincetown, sling your bike over onto the far side of the fence to avoid having it buried beneath other bikes or having to park at the way far end of the bike line. Loop your handlebars over the fence to make sure it doesn't fall down the other side! If you're meeting someone in Provincetown, make sure they're on the road early. Route 6 backs up something fierce on Sunday. Be warned that Provincetown has notoriously bad cell phone coverage, especially out by the Provincetown Inn. It's a little bit better downtown. Don't bring soap into the showers at Provincetown; they provide special biodegradable soaps, since the showers run off into the harbor. You can wade in the ocean near the causeway behind the bike line in Provincetown, if you want to cool off. If you're headed to Race Point or Herring Cove beaches after the ride, be aware that they charge $15 admission until 5pm, when the admission fee is waived. Other nearby alternatives include Truro's Head of the Meadow beach or White Crest Beach in Wellfleet, which you biked past earlier in the day! Write up a ride report when you're done. Not only will it preserve your memories of the ride, but it'll be of interest to your sponsors and other riders. Be sure to look for yourself in the official event photos, which appear on the PMC website incrementally over the weeks that follow the ride. Also look for yourself in event photos posted to the pan_mass group on Flickr, and add your own photos to the collection! Post your photos to Flickr or Picasa or Pinterest, videos to YouTube or Vimeo, etc., and tag them PMC, panmass, or something similar so that other interested folks can find them. Keep fundraising! You've got until October to chase down those people who promised a donation but haven't done so yet. Send out one final reminder as the fundraising deadline approaches. To cap the year, consider attending the check presentation ceremony, which usually takes place just after Thanksgiving. Around the end of the year, enjoy your copy of the annual PMC Yearbook, and share the link to the online PDF with your sponsors. Turn around and start all over again with the "Registration" section, because it's time to reserve your hotel room(s) for next year's ride!